Raise your hand if your kids need classroom organization tips to get squared away for school. As the academic year progresses, you’ve probably attended a parent/teacher conference and heard both the good and not so good about your kid. If your child’s teacher mentioned that lack of classroom organization was disrupting your child’s academic progress, don’t panic, you’re not alone. And if your child has a learning disability you already know how important it is to help them organize their day along with their schoolwork. Since some children (and many adults!) may suffer from what could be called “Messy Desk” syndrome, we’ve come up with a few ways to help children and parents organize their academic workload. After all, getting organized can improve grades, concentration, and can teach kids to handle more substantial challenges. 1. 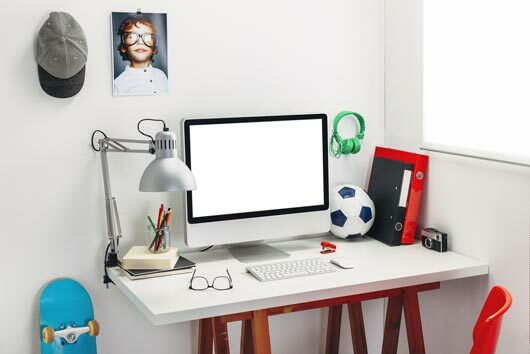 Set up a Workspace A space with a desk is ideal but any place where all the necessary supplies can be kept together will work. Make sure all supplies (ruler, pencil, and calculator) are handy and ready for use.